HindiCine.com: Zindagi Na Milegi Dobara Review: A trip you'd most likely not forget anytime soon..
Zindagi Na Milegi Dobara Review: A trip you'd most likely not forget anytime soon.. There are films which while you see, you really have a great time but soon forget them when you get back to your routine lives or even as as soon as after exiting the cinema hall. But once in a while comes a film which appeals to your senses deeply and you just can't get it out of your head even long after you have seen it, they make you want to go back to that world again, relive that experience, be again with those characters. I felt the same for Zindagi Na Milegi Dobara. Luck By Chance, Zoya Akhtar's debut was a film which made me feel ecstasic about the existence of cinematic medium. There was nothing path-breaking about the film on the face of it yet her understanding and portrayal of raw human emotions and the maturity she showed as a filmmaker was remarkable. No doubt when I first heard about the announcement of a road movie directed by her having Hrithik, Farhan and Abhay playing the leads I was over the moon. However the first look poster with a bare-chested Hrithik was a serious downer to my expectations from Zoya. I quite liked the promos but with a couple of lip sync songs and inclusion of Hrithik-Katrina romantic track made me feel that maybe this film is meant to appeal to a wider audience but still had faith in Zoya that being a sensible filmmaker, she will still do a good job with whatever she does. But buoy! Did she surprise!! Zindagi despite being very different in setting and tone from her debut film has the same finesse in terms of sensibilities. A lot of comparisons has been made with Dil Chahta Hai from the promos but having seen the film I can say that the only similarities are on the surface, Zoya has her completely original style and treatment. If anything at all Hrithik's character reminded me a bit of Farhan's character in Excel's another production Rock On but still it was played very differently so didn't really matter. Zindagi Na Milegi Dobara works on various levels. The portrayal of relationship between the three friends is shown in a very different way and undergoes a graph through the course of the film. These are not college going students but three guys busy with their work lives in early 30s. They all are together after some four years so initially there is a bit of discomfort before they get into their own and go back to their younger days. The humour is not about jokes but the way when close friends are together even the lamest jokes are funny. And more than the dialogues its the silences, the body language and subtle expressions/eye gestures between them that amazingly portrays the relationship between them. The film's main theme is letting go of the strings which we have bound ourselves with be it with our relationships, sense of security, or expectations. All the three friends have their own issues which are due to their own fears more than external reasons much like most issues everyone faces. The daring adventure sports each one undergoes overcoming their fears is a metaphor for the fears they face in their lives and how facing and overcoming those fears liberates them from the baggages they had. The adventure sports be it sky diving or deep sea diving are showed in a very uncharacteristic manner. More than the sense of adventure its the sense of liberation and feeling alive that has been portrayed through the way these scenes have been shot, performed and edited. Without a doubt these are amongst the most brilliant sequences I have seen in recent times. Farhan's scene with his father is also truly a brilliantly sequence one which was so heartbreakingly real that it was unnerving but truly liberating at the same time. Though I just loved the film but had certain issues too. I felt with the presence of the Senorita song, the Tomatina festival song and the whole sequence though well shot was not really needed. Apart from it there were quite a few scenes which I felt could have been done without. Its not the pace I am talking of, infact the best thing about Zoya's direction is how she lets the scene play on without any hurry in a very self-assured way that brings out the magic. The small lip sync portion in the otherwise excuisitely shot Khwabon ke Parindey song was also jarring. Also felt that Hrithik's and Abhay's issues could have been more substantiated. However the real triumph of Zindagi is not in the story but how its told, the absolutely magical moments that just refuse to leave you and makes you want to revisit them all over again. 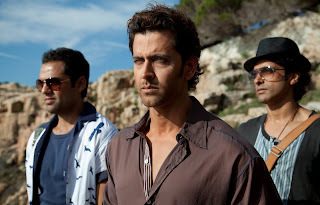 The best thing about the trio of Hrithik, Farhan and Abhay is that they are three completely different persons with very different acting styles and their characters are very close to their real selves which brings about a very interesting and unusual chemistry between them. It would not be wise to compare their performances because each of them compliments the others and also stand out as individuals. The preference if any can be for the characters not for the performances. Its amazing how someone like Hrithik who is known to steal the scenes from his co-stars plays a role where he is just one of the three friends without any larger than life attributes. Infact initially his character is somewhat snobbish and calculated but after the transformation he is just something else, truly letting go of his insecurities. His magic moment in the film was for sure the one just after deep sea diving, makes you realize what a truly gifted actor Hrithik is. Farhan's character is complete opposite to that of Hrithik's therefore the issues between them. He plays the happy go lucky guy who doesn't care much about things and just likes to have a good time. Though the deeper layers of his character are revealed as the film progresses and he pitches a truly fine performance one which had the biggest risk of coming out as fake and labored. Abhay's character is the most balanced and he is so comfortable with it that you are amazed with the ease he carries off himself, this guy never disappoints or fails to surprise. I was really concerned with Katrina's inclusion in the cast but she came off so well that I was not surprised Hrithik's character fell in love with her. Kalki's character could have so easily been cliched but she manages to make it believable while serving its purpose which in itself is commendable. Special mention should be made for the Director of Photography Carlos Catalan because ZNMD is one film where visuals play an absolutely pivotal role in the whole experience of the film. The way the sky diving, deep-sea diving sequences and the entire time they are on road is shot has to be seen to be believed. Its not just about the beautiful frames but the freshness and the feel they lend to the movie. Editing by Anand Subaya and Sound design by Baylon Fonseca is also of the highest order. All production aspects of the film are in perfect sync to realize the vision of the filmmaker in the best possible way. Javed Akhtar's brilliant poetry recited by Farhan Akhtar at pivotal points is a brilliant masterstroke that elevates the whole experience. Zindagi Na Milegi Dobara despite some rough edges is a film which may deeply affect you with its heartfelt and uncompromising storytelling. Go watch, its worth going to the cinemas if you don't want to regret later that you missed it on big screen when you catch it on TV and chances are you'd want to watch it more than just once. wow Apan a really nicely written review. I CANNOT Wait to watch errrr experience it for myself and I'm sure I won't be disappointed. One of the best reviews I have read of this film. Does complete justice to the film.